Sarah Ryley is helping lead the charge for data driven journalism at the New York Daily News. The Tableau vizzes she’s made as the Assistant City Editor for the Manhattan-based newspaper have set records. Her first dashboards on the NYPD Stop and Frisk program were the very first Tableau Public vizzes to hit one million views last July and still remain some of the most viewed vizzes of all time. Since breaking the million view record, Ryley has created a number of innovative dashboards for the Daily News. 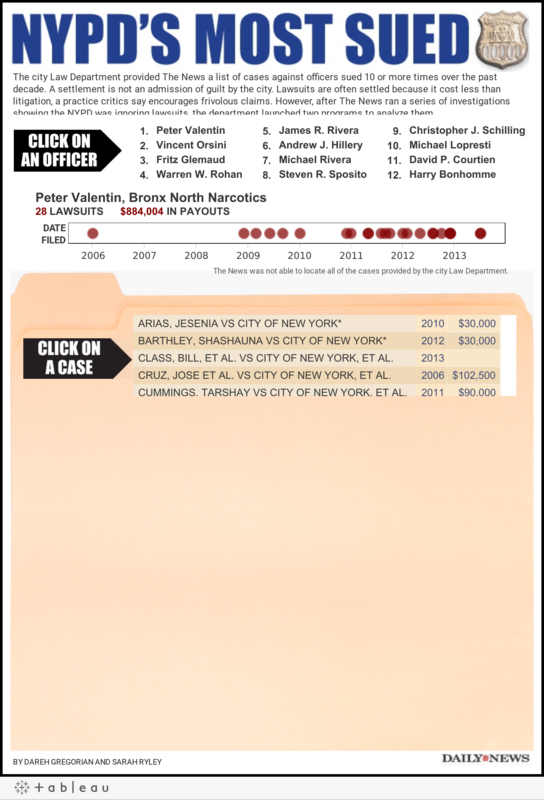 Recently, she created this visualization, the most-sued NYPD officers over the past decade. Her novel use of DocumentCloud to embed PDFs of court records into the dashboard has been getting buzz at the Daily News, in the Tableau offices, and online. “Everyone really likes it!” Ryley beamed. “It’s not even really anything crazy or complicated. It only took me like a half hour to build. It was really quick,” Ryley said with regard the Document viewer in her visualization. She explained that using URL action to control an embedded webpage on a dashboard was a trick she learned for a previous Tableau Public dashboard on open murder cases, so it was easy for her to build off of that concept. To the surprise of many, Ryley has only been using Tableau Public for about a year. “I went to IRE and saw a demo and was really interested in the possibilities,” she explains. She followed up, signing up for a full day training at NICAR the following year. “I waited an hour before class started to be sure I got a spot..” Luckily for the readers of the Daily News and for all her fans here at Tableau Public, a spot did open up. “After that, I had a pretty good idea of what could be done, but it was really helpful to have someone from Tableau to talk to and work with to make my ideas reach fruition,” Ryley states. 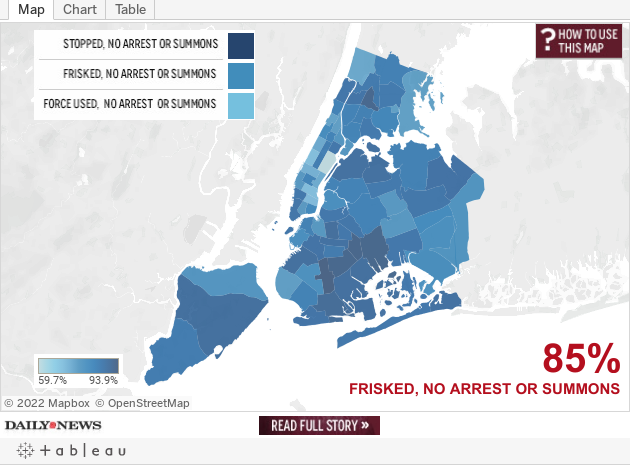 After the training at NICAR, she reached out to the Tableau Public team with over 500k rows of data on the Stop and Frisk program and lofty ambitions to create a densely data-driven story highlighting the inefficiencies and injustices of the program. Speaking of data, hunting down more of it is a goal for Ryley this year. “When I go to NICAR this year, my goal is to learn how to web scrape and build some scrapes for stories,” she says. Tableau Public has already given her the tools she needs to manipulate the data. “The software is great and easy to use on the fly for exploring data and stories. It’s much more fun than Access. If you look at other free tools that are out there, they can’t do nearly what Tableau can do without any programming knowledge.” But having the ability to analyze her data doesn’t mean anything if she can’t get the data she needs for her stories.